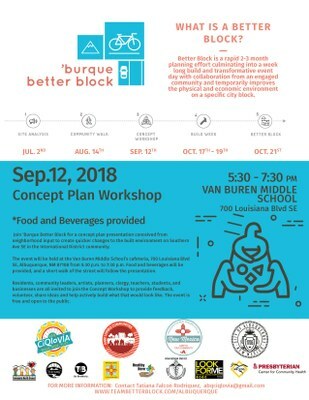 Join 'Burque Better Block for a concept plan presentation conceived from neighborhood input to create quicker changes to the built environment on Southern Ave SE in the International District community. The event will be held at the Van Buren Middle Schools cafeteria, 700 Louisiana Blvd SE, Albuquerque, NM 87108 from 5:30 PM to 7:30 PM. Food and beverages will be provided, and a short walk of the street will follow the presentation. Residents, community leaders, artists, planners, clergy, teachers, students, and businesses are all invited to join the Concept Workshop to provide feedback, volunteer, share ideas and help actively build what that would look like. The event is free and open to the public. What is a Better Block? Better Block is a rapid 2-3 month planning effort culminating in a week long build and transformative event daywith collaboration from an engaged community and temporarily improves the physical and economic environment on a specific city block.